Linguistics and Education is an international peer-reviewed journal that welcomes submissions from across the world that advance knowledge, theory, or methodology at the intersections of linguistics and education. The journal is concerned with the role played by language and other communicative/semiotic systems in mediating opportunities for learning and participation in a globalized world. Research published in the journal engages with the complexities and changing realities of educational contexts and practices, focusing on all levels of formal education, as well as a wide variety of informal learning contexts throughout the lifespan and across modes, genres and technologies. Linguistics and Education encourages submissions that incorporate theories and methodologies from all traditions of linguistics and language study to explore any aspect of education. Areas of study at the intersection of linguistics and education include, but are not limited to: sociolinguistics, discourse analysis, critical discourse analysis, conversation analysis, linguistic anthropology, ethnography of communication, language socialization, narrative studies, gesture/sign/visual forms of communication, social semiotics, literacy studies, language policy, language ideology, functional grammar or text/corpus linguistics. 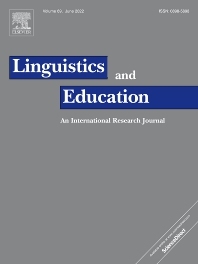 Linguistics and Education is a research-oriented journal. Papers may address practical and policy implications for education but must be built on robust research and have a strong conceptual grounding in their analyses and discussions. Linguistics and Education welcomes papers from across disciplinary and interdisciplinary research traditions that reflect principled application of qualitative, quantitative or mixed methodological paradigms and research designs (e.g. case studies, ethnographic fieldwork, experimental/semi-experimental studies, etc.). Papers must be relevant to an international readership.